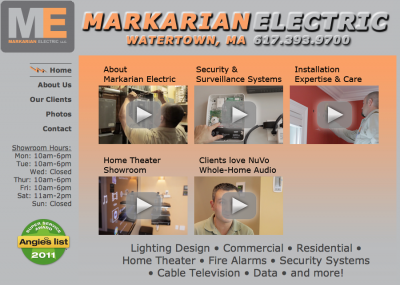 About a year ago or so I produced a business profile video for Markarian Electric, a great electrical contracting firm that was based in Waltham and now is operates from Watertown. Eric is one smart cookie and his company is growing beyond the traditional “wires in walls” to include security and home theater offerings, so we worked out a way to create a series of videos that introduce his company to prospective (and existing) clients to the many facets of his company. After producing the videos, including a client testimonial, I worked with Eric to integrate the videos into his website’s homepage. I used the prettyPhoto jQuery library, which made inserting the videos into the page pretty simple and they play using a lightbox style viewer. The videos are hosted on YouTube. There are plusses and minuses to this approach, but overall using YouTube provides the best balance between cost and presentation. Eric’s astute use of video shows the value of starting with a basic profile, which sums up your business in 60 seconds or so, and then expanding the video assets to provide your clients the opportunity to explore the depth of expertise your business has to offer. In the case of Markarian Electric we wanted to show the care that goes into working on a home or business by showing how an installation is done, introduce people to their security products and, finally, give a sense of what it is like to visit their Watertown showroom where they have examples of their whole-home audio and home theater products. We validate these videos with a great client testimonial – providing a sense of what it is like to be a customer and how you and your home will be cared for. We plan to refine the presentation on his website as part of a planned redesign, but even today his site shows how you can place video up front as a way to quickly engage and educate your clients. 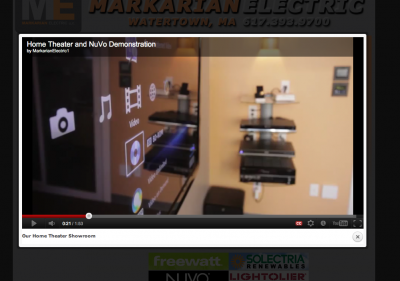 Please visit Markarian Electric to see the videos in action.